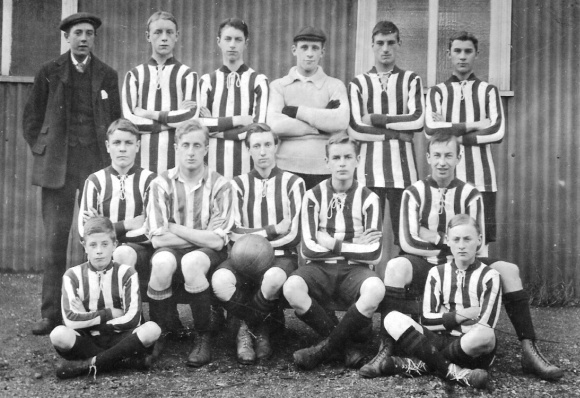 Janet McNamara sent several photos featuring Brentford's John May (Jack) Clarke, born 1889. Jack is the the goalie at the centre back but what is the team and where did they play? Jack looks to be aged 16 or older, suggesting a date of around 1905 - 1910, the two team members sitting at the front look younger - about 13? The strip consists of striped shirts with lace-up fronts and knee-length shorts, the boots look ankle high. Does their kit provide any clues I am missing? If you can add any names or suggest which team is shown, please get in touch.